802.11ax is a new WiFi standard offering better performance, especially in high-density scenario, where average per usage bandwidth may be improved by up to 4 times, so city dwellers should benefit the most. Last year, we started to see 802.11ax compliant chips from Broadcom, Marvell, Qualcomm, and others, so it should come as no surprise that some of first 802.11ax WiFi routers are launched this year. 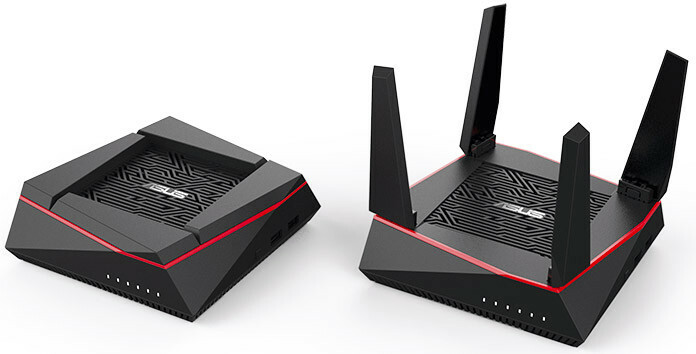 ASUS introduced two 802.11ax WiFi routers at Computex 2018 with ROG Rapture GT-AX11000 tri-band 802.11ax router, RT-AX88U dual band 802.11ax router , and the AX6100 WiFi System for mesh networking. This router is apparently designed for very large homes, and supports features like “triple-level game acceleration”, ASUS AI Mesh, and more. Visit the product page for a few more details. 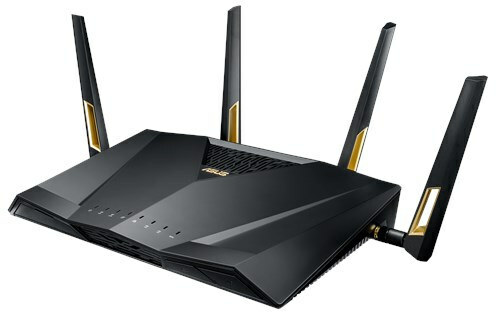 This model is said to be based on the Rapture router, but with a dual band design supporting up to 6000Mbps which should make it more affordable. The router also supports AIMesh. More information can be found on the product page. 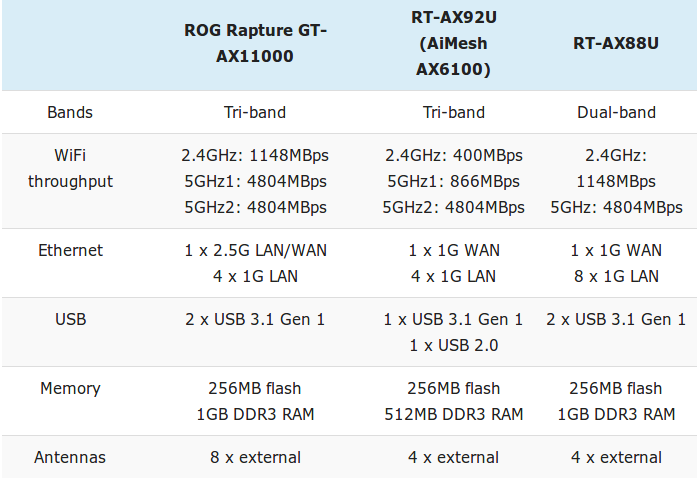 I could not find a product page with the full details for that model, but a blog post on ASUS website reports AX6100 WiFi system is comprised of two packs of RT-AX92U nodes used to extend coverage and eliminate dead spots. They are much more compacts than the two 802.11ax described above, but the tri-band routers still support up to 6100Mbps aggregate bandwidth, and come with 5 Gigabit Ethernet ports. 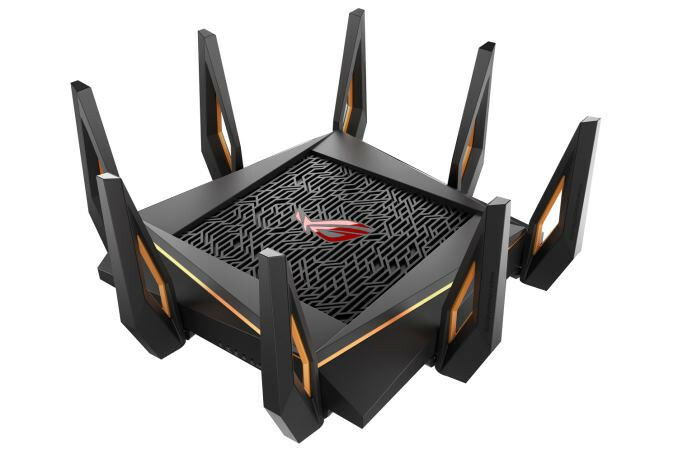 The ROG Rapture GT-AX11000, AiMesh AX6100 WiFi System, and RT-AX88U routers will start selling in Q3 2018, but pricing has yet to be disclosed. I have the previous model the RT-AC5300 which works very well for large homes (4000+ sqft) and even has decent coverage (> 100mbps) outside through a brick wall. Are these based on the final 802.11ax stnadard or some Draft version? Draft, the final spec isn’t due until next year.